*This post contains affiliate links. If you decide to make a purchase, it doesn’t cost you anything extra and helps to support Persia Lou. Thanks! 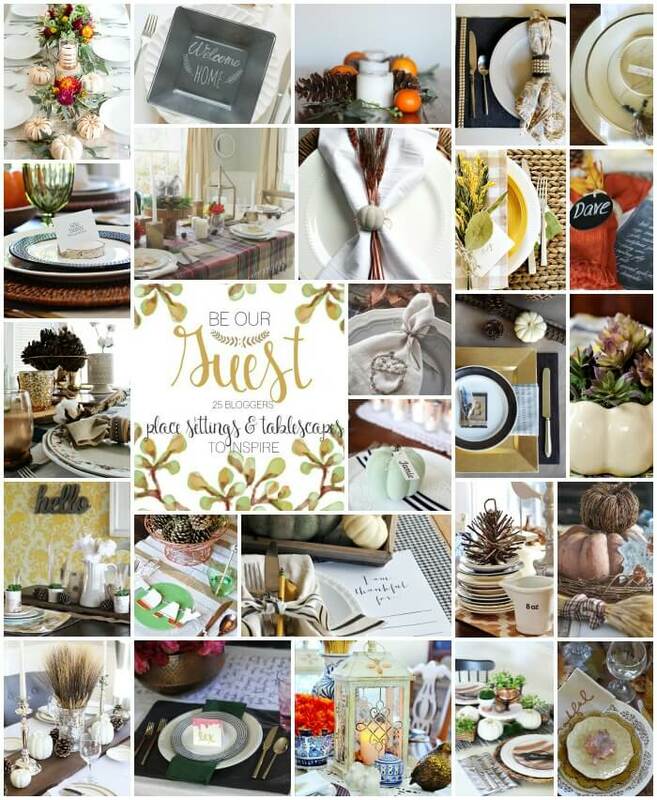 Today I am really excited to be joining together with some of my favorite bloggers to bring you all lots of fall and thanksgiving tablescape and place setting ideas! You can find links to all of this tabletop goodness at the end of this post. But first, let me share what I’ve put together. I am hosting our family’s Thanksgiving this year, and decided I wanted to do something a bit more fancy than paper plates. 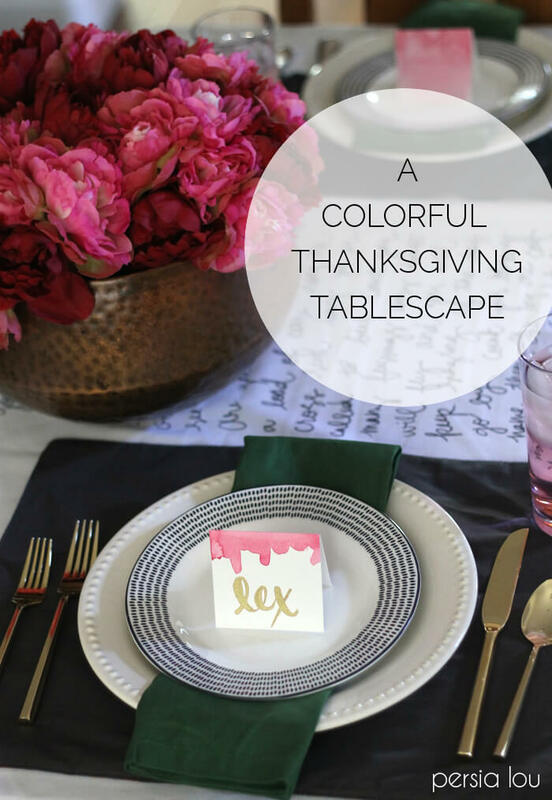 My Thanksgiving table started with a tablecloth DIY that I’m really excited about. Several years ago, my mom had the idea of getting a special tablecloth that we would use every year for Thanksgiving. During dinner, everyone would take a minute to write what they were thankful for that year on the tablecloth with a permanent marker. As the years go by, the table will slowly fill with notes of gratitude, and we can look back and see who was with us each year. I loved the idea of the tablecloth, but after a few moves, the one we used that year has been misplaced and hasn’t come out again. I decided to bring the idea back for this year’s Thanksgiving. 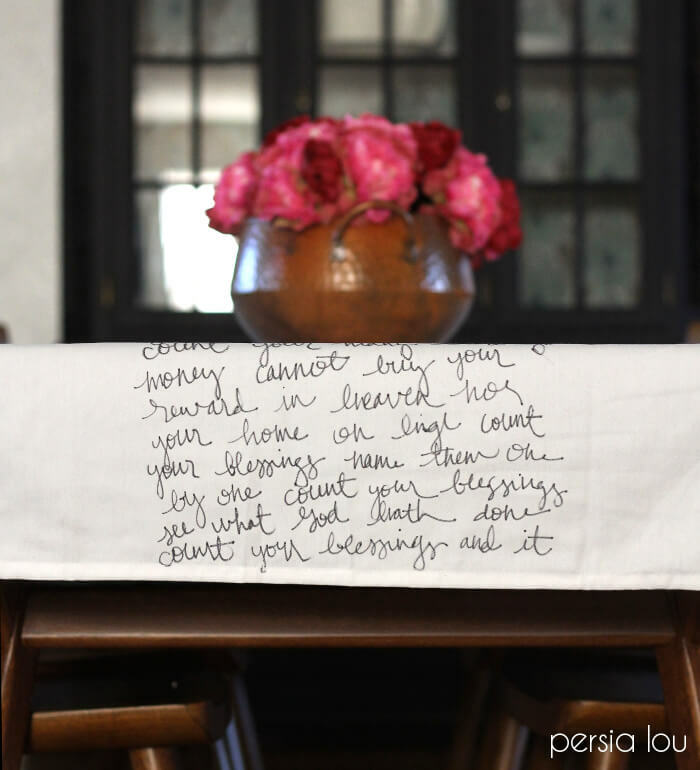 To create our new gratitude tablecloth, I started with long, white, rectangular tablecloth, and added a kind of hand lettered runner down the middle. Using a permanent marker, I wrote out the lyrics to “Count Your Blessings” down the center of the tablecloth. I just freehanded it using a ruler as a guide. For the rest of the table, I added pieces in green, pink, and gold. Pink may be a bit of an odd choice for a Thanksgiving table, but I’ve never been big on traditional fall colors. And it may be just me, but I think the dark green makes it a bit more fall-ish. I picked up a set of gold flatware from Target. I have only ordered one set so far because I want to wash them and see how they hold up before I order a whole bunch. I will let you all know how it goes – they sure are pretty now though. For my centerpiece, I used a copper ice bucket from World Market and a few bunches of artificial pink and red peonies also from World Market. I might get some real flowers for Thanksgiving, but these are really pretty for right now. I also made some DIY watercolor placecards that I will be sharing a tutorial for soon. And that’s my tablescape so far. What do you all think? Are you hosting Thanksgiving this year? Do you do a formal table for Thanksgiving or keep it more casual? If you are hosting and looking for ideas, look no further! We have 25 beautiful Fall tables for you to peruse. Enjoy! Gorgeous! &amp; a fan of those colours! Like Corey – can&#39;t wait to see how you made those places cards! Perfectly you, friend!! I absolutely adore the tablecloth idea — such a great keepsake too! Thanks for joining in on the blog hop fun. HUGS!!! What an awesome idea for the table cloth! I love it Alexis 🙂 The colors are beautiful too! Just love this and instantly started singing the song! 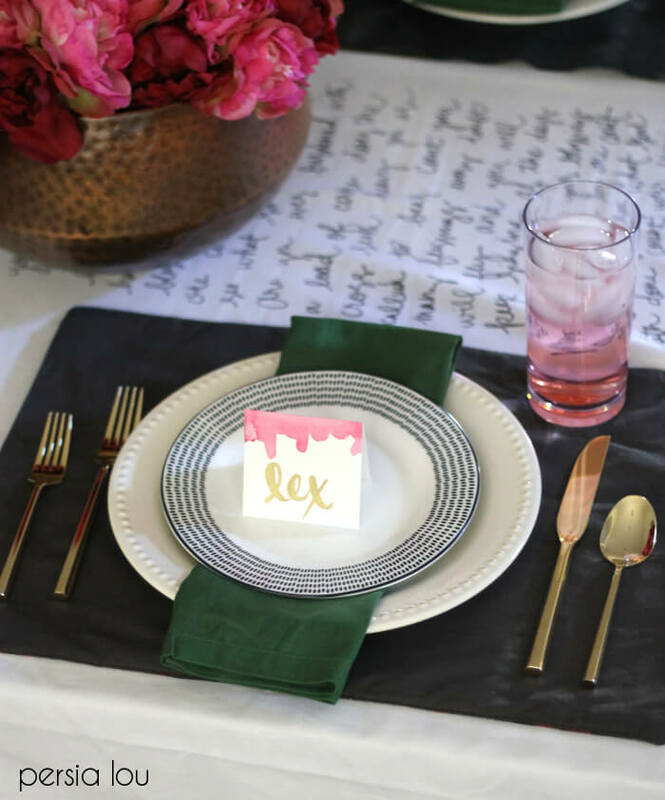 Love, love, love the tablecloth, Alexis! What a cool idea! Your tablescape looks amazing! beautiful! love the modern look and colors, and the tablecloth is super sweet! This is such a fun idea and the colors are beautiful! Love the tablecloth and the beautiful water colour placecards!! So pretty!! The tablecloth is such a great idea! 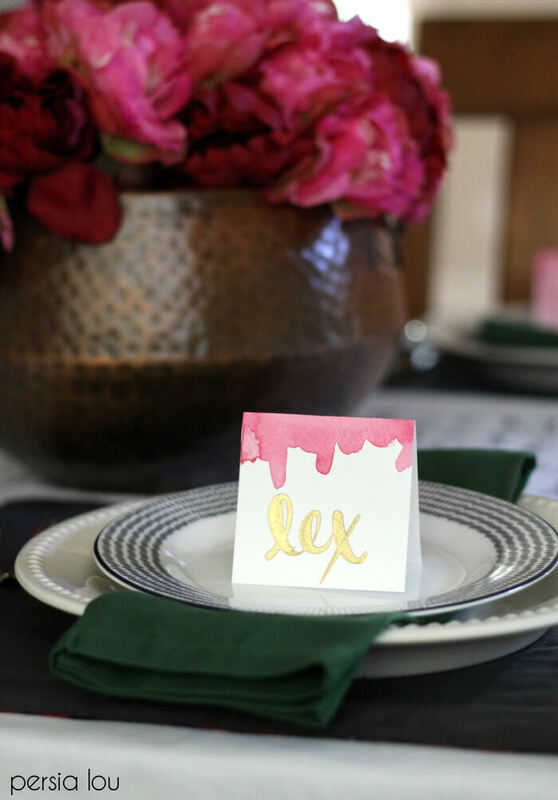 And I love those watercolor place cards! They&#39;re so cute! Oh pink for Thanksgiving is so unique! The tablecloth idea is so special….something to treasure from year to year. I love that you threw in the pops of pink! 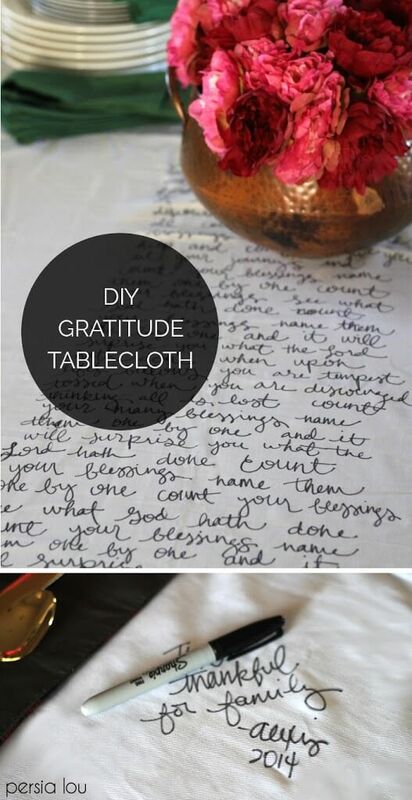 Love the idea of a gratitude tablecloth. So thoughtful.